Day 18 of the 31 Days of Books Giveaway: Where in the World Would You Like to Travel? Congratulations to Libby Waterford, who won yesterday’s drawing! I’ll be emailing Libby to arrange delivery of her choice of book. I love to travel. I’ve actually managed to visit a good chunk of the United States. Since I grew up in the shadow of New York City, I’ve been up and down the east coast, from Vermont all the way down to Florida. I’ve also been to Pennsylvania, Ohio, Texas, Louisiana, Illinois, Washington DC and Washington State. Since moving out west, I’ve been to New Mexico, where we stayed at the Zuni Pueblo for a couple of days and visited Old Town Albuquerque doing research for my second paranormal, Heart of Stone (due out Oct. 2014). We went to Arizona (Sedona, Flagstaff, Tempe, Phoenix) and Nevada (Las Vegas, Reno and Laughlin). And of course, various spots in California from San Francisco all the way down to San Diego. I’ve been to Graceland and Hawaii. 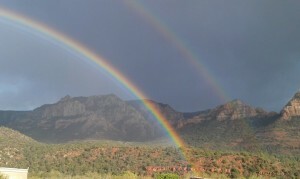 Below is a picture of a double rainbow I took in Sedona. It had just stopped raining. I’m a language nerd. I speak four languages (English, Spanish, French and Italian), and I’ve always been fascinated by different cultures. How cool to live in the United States, where I get to meet people from so many ethnic backgrounds! I learned to speak the languages in high school, and at age 16 I had the opportunity to go to France in a student exchange program for a month during the summer. I paid for it myself with money earned from my job at Burger King. I stayed with a French family in Provence, and with them I went to Marseilles, Aix-en-Provence, Nice and Cannes. I saw the bullrings at Arles and the red rock of Roussillon, and I walked along the top of the Pont du Gard, an ancient Roman aqueduct near the city of Nîmes. We took a weekend trip once to go to this huge outdoor market in the town of San Remo, just over the border in Italy. We drove through the south of France and had a pit stop in Monaco, where I watched the changing of the guard at the royal palace, before continuing on to our destination. In San Remo, I swam in the Riviera. To this day, I love the movie French Kiss with Meg Ryan and Kevin Kline because it reminds me of this life-changing trip. I rode that train from Paris down to Marseilles. I saw those fields of grapes and lavender. I came back a different person, just like the title character in Sabrina. Soon after I married my husband, he and I took a trip to Ireland and Scotland. I walked over the moors (the heather grows in clumps), visited Culloden where the bloody battle was fought, and rode in a boat over Loch Ness. We toured castles (for me) and whiskey distilleries (for him). In Ireland we visited Blarney Castle and the Rings of Kerry and stood on top of the Cliffs of Mohr. We took The Quiet Man movie tour, where a guy named Paddy Rock drove us all over the countryside in Mayo and Galway to show us all the places where they’d filmed the movie. There are still places I want to go and things I want to see. In addition to languages, I’m an ancient civilizations nerd, so I would love to go to Greece. I also want to go back to Italy and see more than one small town. 🙂 I’d like to go back to Ireland with my entire family, and I’d like to go to England. Though I’ve set many books there, I’ve never actually been there! What about you? Where would you like to travel? What is your dream trip? 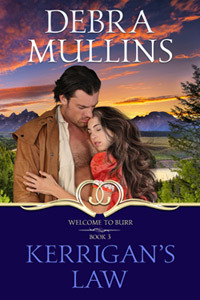 Those who comment get entered in today’s drawing for a free paperback title from my backlist!